With Spring approaching there are a lot of food trucks planning their grand openings. Not only is a grand opening exciting but it can also be terrifying. A new food truck is full of potential and possibilities. But one of the first great challenges is to get the word out. New food truck marketing is more complex because you are new to the industry and are most likely going it alone. Luckily for the independent food truck owner, spreading the word about your food truck’s grand opening is much easier than it once was. New vendors have access to marketing channels such as social media and e-mail to help create buzz and anticipation. Today we’ll share three easy ways for vendors to start your new food truck marketing to build buzz about your upcoming grand opening. Build buzz on social media prior to launch. Regular social media posts about the progress of your food truck are key to getting and the attention of potential customers. Consider posting pictures showing progress, like the wrap or kitchen being installed in your truck. Share pictures of staff uniforms, menu reveals, staff prepping food the day before opening, etc. Although these may seem like mundane updates to you, it’s a great way to build anticipation to your opening. Use existing social platforms. A cross promotional campaign can attract the eyes of those already committed to you and your food truck brand. Consider going to Facebook Pages of the cities you will be working in to suggest Liking your new food truck’s Facebook page to be entered to win a $25 gift card. Start revenue streams before your truck opens. Promote your food truck’s gift cards prior to the opening via Facebook posts and enabled your food truck Fans to purchase them right on Facebook via a Facebook Tab. Not only will these social media strategies increase your Facebook fans, Twitter followers and email subscriber months before food truck opens the service window for the first time. 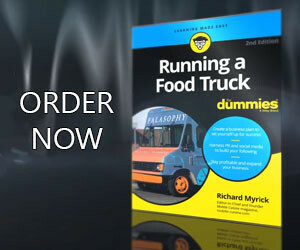 But it will be a great start to getting you started in marketing your food truck. When it comes to new food truck marketing, start early, but make sure you have something to say.